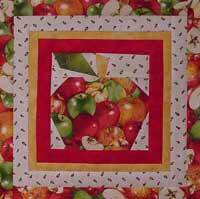 Use fabrics for the apple according to what type of apple you are making (Red Delicious, Granny Smith, Golden Delicious, etc.) You could also use a fabric that has apples on it. Make the border for each block different than the other blocks for another added interest. Red for Apple: 7 �" x 6"
Green For Leaf: 3 �" x 2 �"
Brown For Stem:	2 �" x 1 �"
Light For Background: 4" x 10"
Border: 10 �" x 10 �"
Remember that the printed pattern is a mirror image of the design. 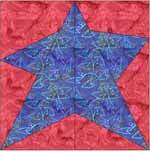 You will be placing your fabric on the unprinted side and sewing on the printed side of the letter pattern. Cut the pattern out with 1/4" seam allowance on all sides of each section. 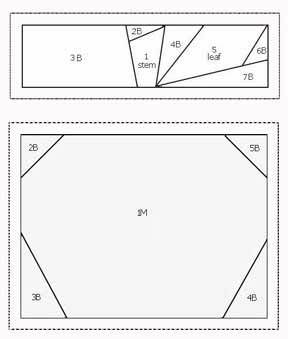 Read Foundation Piecing Basics Vol 1 for general paper piecing instructions. This block has two sections. Piece each section seperately before joining the sections. Piece in numerical order, the numbers start over for each section. 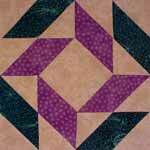 See Step 15 of the Foundation Piecing Basics Vol. 1 for joining the two sections. 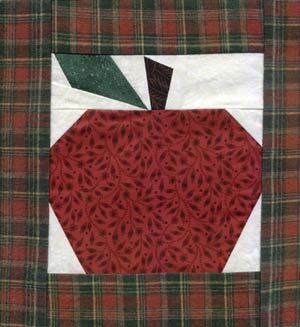 Cut two (2) strips 9 �" x 2 �"
Cut two (2) strips 6 �" x 2 �"
Sew the two 6 �" strips to the top and the bottom of the apple block. Press seams toward border fabric. 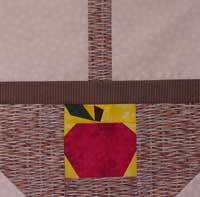 Sew the remaining 9 �" strips to the other two sides of the apple block. Press seams toward the border fabric.